Notes: Relatively few Starfleet shuttlecraft are capable of undertaking true interstellar journeys, and those that are tend to be the larger classes. Although Starfleet has occasionally requested the resources to correct this situation, such projects have never been a high priority and have tended to be cancelled in their early stages. It was 2368 before Starfleet finally decided to really push for a new design to correct this deficiency; in this year a request was made for a new type of shuttle capable of carrying one or two people across distances of several light years in relative comfort, or of carrying up to four persons on shorter duration missions. The speed requested was much higher than most previous vessels, in line with the general trend towards much faster vessels which has been a recent feature of all Starfleet designs after recent advances in warp propulsion technology. The design process was implemented late in 2368 and was almost completed by early next year when Starfleet halted the program and reassessed its requirement. It was decided that several new features should be included in the craft; these included an increase from one to two micro torpedo launchers, a more capable onboard computer system, and a beefing up of the armament by the addition of two phaser arrays to the single emitter which had been the only beam weapon. In addition, Starfleet asked the designers to simplify and modularize the design in order to allow semi-industrial replicators to produce whole sections, and full industrial replicators to produce almost complete shuttles in one pass. The Federation has still not perfected replication technology to the point where warp coils can be produced, but the new design included a modification of the nacelles to allow very rapid installation or swapping of the coils. Production facilities would now be able to produce a basic Type 9 shell virtually at the press of a button, and install a full set of warp coils within less than an hour. Smaller replicator units such as the semi-industrial models carried by many Federation Starships could produce a Type 9 shell in twelve 'bolt together' sections which could them be assembled and fitted with coils in under twelve hours. 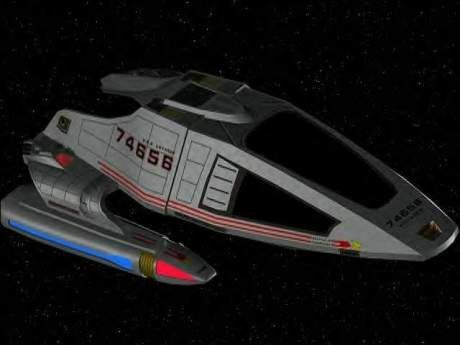 This gave Starfleet an extremely broad range of options in producing the Type 9 - even small Starships such as the Saber class can easily produce six or eight of these handy little craft at once from their standard replicator stocks, removing the coils and converting the shells back to their raw materials when they are no longer needed. This virtually removes the need to maintain a large fleet of Type 9's, which frees up valuable hangar bay space within Starships and even more valuable production capacity within Federation shipyards. The first ships to try out this new construction philosophy under normal field conditions where the Intrepid class; the USS Intrepid replicated three Type 9 shuttles during her maiden voyage in 2370, and reported complete success with all three. When news of the predicament of the Intrepid class USS Voyager reached Starfleet in 2373 it was learned that the ship had lost several shuttles during their attempts to reach home, and had had to rely heavily on their ability to replicate new craft. Starfleet has viewed this as a triumphant vindication of the Type 9 concept, and has announced that this feature will be a basic requirement of all future small craft designs. Although Starfleet headquarters has - naturally - not said as much, it is likely that the recent proliferation of fighter level craft during the Dominion war is due in large part to this new philosophy. It seems likely that new or modified fighter designs will have been circulated which are suitable for shipboard replication, allowing the use of Starships as mobile construction facilities. If true, this would increase the Federations production of fighters by at least tenfold at a stroke.